He got Judge's Choice at the 5 largest shows in 2012 and then got Judge's Choice at the Suri Network Fleece Show. He is amazing and should be considered for a breeding to improve offspring on Suri farms. Electrofyre has the fiber, the conformation and he is the perfect Suri breed herdsire example. 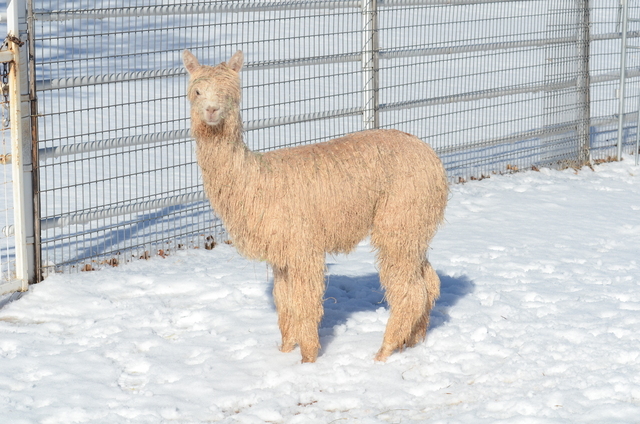 He has to be one of the most awesome Suri alpacas full Accoyo boys I've ever laid eyes on, the complete package of luster, density, lock consistency, excellent conformation with superior boning. 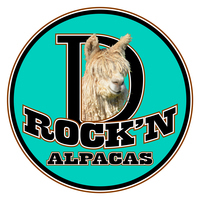 He can only do good things for Suri alpaca genetics. We are very excited to announce that Lilly’s Spit Fyre has been added to our foundation herd. This young female has been tearing it up in the show ring over the last months. 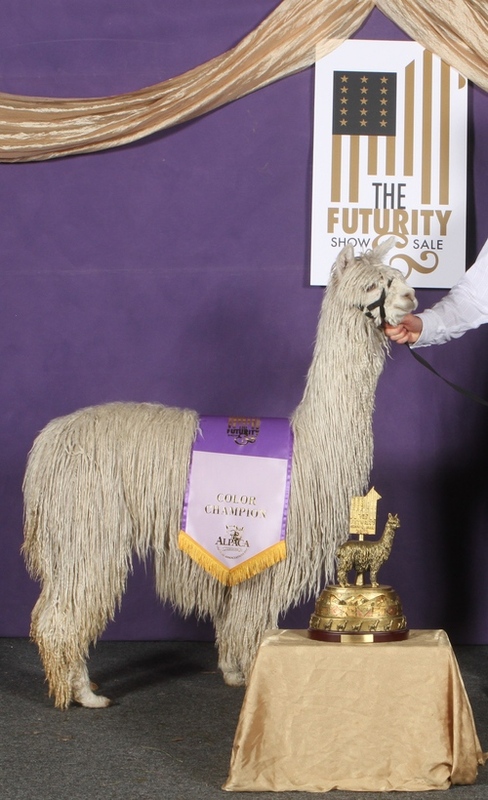 She received Reserve Championship at MOPACA in 2012 at 7 months of age and Reserve Championship at GWAS in 2012 at 8 months of age. Most recently, Spit Fyre was awarded Color Championship at the 2013 National Western Stock Show. Spit Fyre has it all – ideal conformation, density and luster with advanced twist and wave fiber characteristics. We are looking forward to Spit Fyre’s 2014 offspring. With her exceptional genetics from the genetic powerhouse Helios and Peruvian Easter Lilly, they are sure to be very competitive in future show rings. Crossfyre has the full package; density, lock structure, fineness and luster! 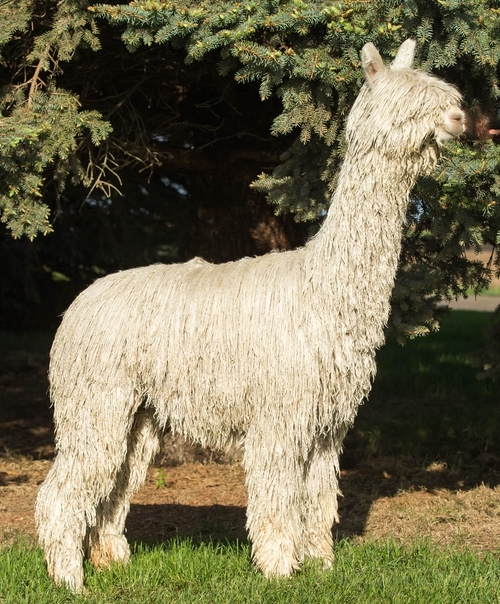 Crossfyre was bred to 7 x Color Champion and 4 x Judges Choice WI Limited Edition, son of Goldstar and has two stunning crias. 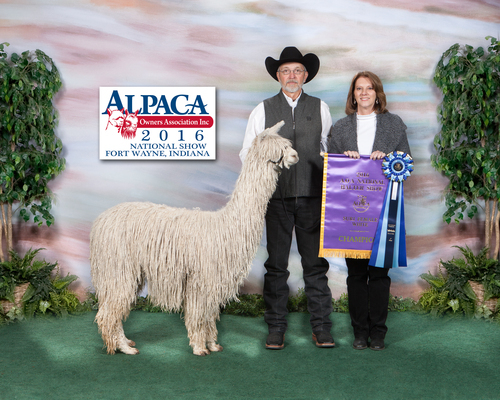 2017 cria, RDE's Maserati Limited Edition won the 2018 AOA National Walking Fleece Color Champion and 1st place in Halter class as a juvenile. 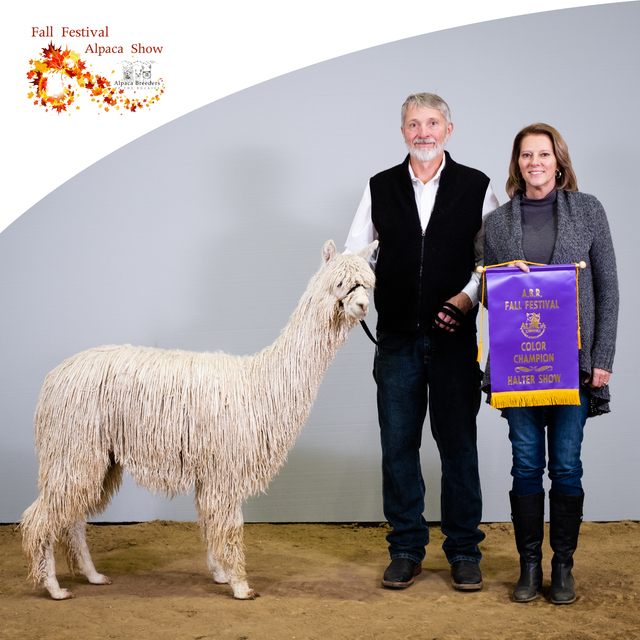 He won Color Champion at the 2018 Fall Festival as a yearling. Maserati won Supreme Champion at 2019 AOA National show and Judges Choice in Halter and Walking Fleece at MOPACA two weeks later. 2018 cria, RDE's Rolls Royce Limited Edition already looks like he will be as good if not better than Maserati. Royce won Color Champion at 2019 AOA National show as a juvy. 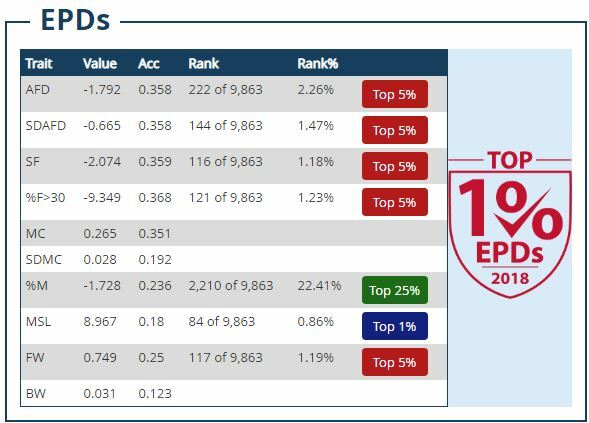 Don't miss out on producing Champions.!!!!!!!!!!! Genetics don't get any better than this so you'd better not wait. Crossfyre is bred to WI Limited Edition in Spring 2020.